The bees kept on coming. Doing what bees do. Being what bees be. They nestled into and alighted from the sun soaked blossoms, completely unaware that the Brussels sprouts so carefully seeded and tended in hoop covered rows from autumn, through winter into the accelerating spring warmth had technically failed. Traces of sprouts had appeared, but none had matured. All had withered away. Never in 13 Ozark growing seasons have I met anyone who has successfully cultivated Brussels sprouts. Too hot? Too buggy? Too rocky? So many possible impediments. Somehow untouched by this viewpoint, my avid gardening partner, Carol, planted seed for a veritable Brussels sprouts forest in her raised beds last fall. It was with her healthy-leaved, flower-rich plants that the bees communed last Sunday, while we pulled up bittering lettuces, toughening kale, and seeding cilantro to make room for warm weather friends — tomatoes, peppers, cucumbers, squash. There was no question of letting the “failed” Brussels sprouts remain for the bees. Indeed the only question that lingered was the question of our human “being” and our human “doing” in the face of individual and shared 21st century challenges. You know the list. Our major religions all speak of Love. Our heroic myths tell of strength, courage, devotion and daring. In the presence of the bees (who seemed so sure and easy in their mission and their being), I wondered for myself and for us as a species, will I/we commune with and respond from the flower the Heart? To what extent will I/we pollinate life with bravery, insight, resolve, and compassion? I hope we will respond on par with the grace and confidence of bees. This entry was posted in Response and tagged Bees, Brussels Sprouts, Gardening, Love, Myth, Religion, Response on May 4, 2016 by Jan Schaper. 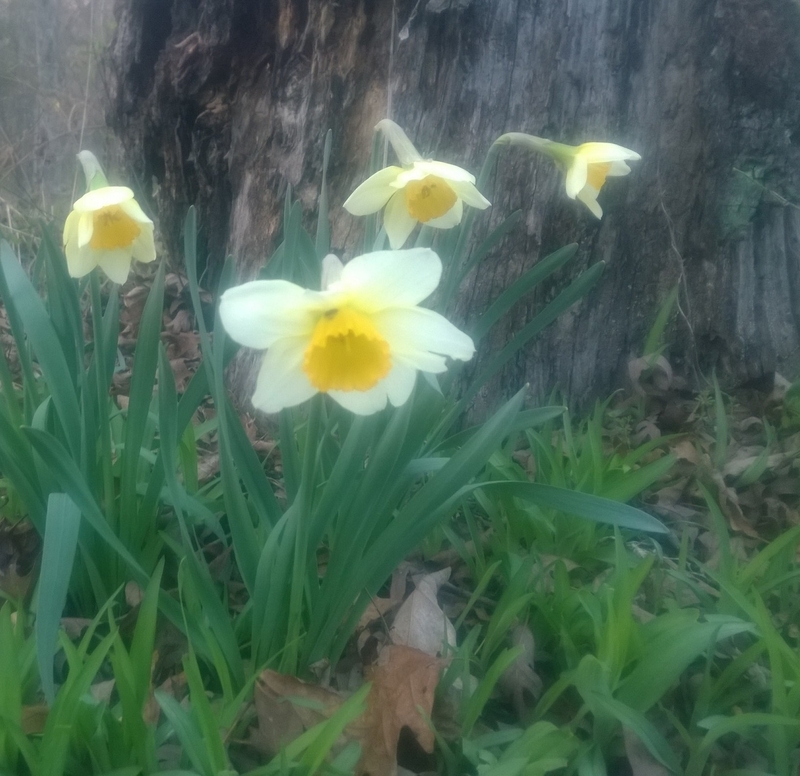 Spring peepers and fearless hail-battered daffodils saturate the Ozarks with vernal song and color. They exude Existence. Confidently, naturally, playing their parts in the Season’s theatrical emergence. How to do we find our way to such certitude of Being and Expression? How do we discover, claim, grow, and re-grow into our individual Sacred Role, our Natural Niche, as we and our life circumstances shift and mature within the Planet’s rapidly evolving narrative? Blogger Christa Rose Avampato recently offered a wise post on the subject of change and life purpose, emphasizing the necessity of perseverance, alertness, and self-awareness. I add the suggestion of paying attention to the archetypal stories and deep-sourcing myths whose symbols appeal to the imagination and stir the Heart’s curiosity. Hero? Warrior? Healer? Mother? Bard? Traveler? Fire Keeper? Chalice? Dagger? Rose? Desert? Mountain Top? Dropping into a character’s essence and mission evokes hints of our own potentiality and direction. Thoughtfully considered in relation to current life circumstances, these intimations catalyze Self-clarity and prepare us to choose. To act day by day. Stretching. Experimenting. Building endurance of Being and Expression. Claiming our role. Perhaps even glimpsing Life’s guiding Intention and affirming our place therein. I’m currently delving into stories of alchemists and the Great Healing. I feel this is not a final myth for me, but rather a much-needed transitional one, urging transfiguration of fears blocking full action on long-held writing aspirations. It’s not an easy role for me, but what heart-worthy effort is? What myths or approaches keep you in touch with your purpose? This entry was posted in Endurance and tagged Alchemy, Myth, Purpose on March 27, 2015 by Jan Schaper.